The results of the swap didn’t disappoint. However, there are certain things that a person making a tenderloin steak should keep in mind. 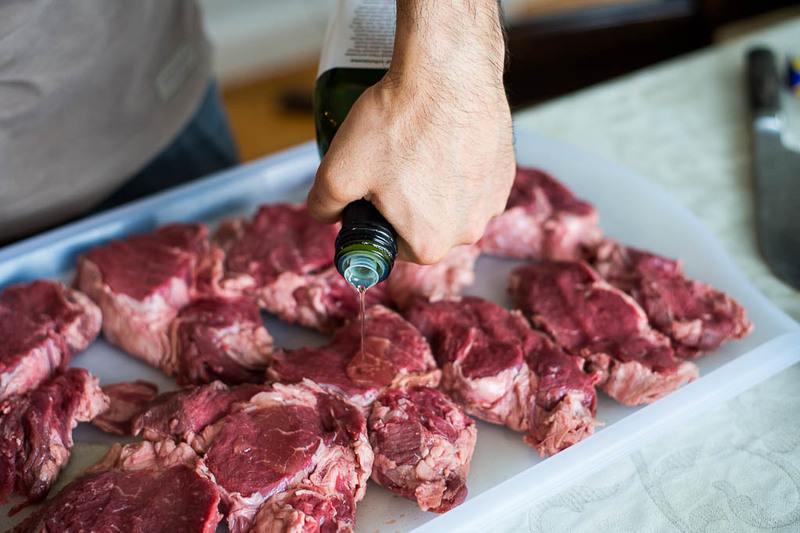 Tenderloin cut (a.k.a file mignon) is one of the finest cuts of meat. It is soft and very tender. It also happens to be one of the least fattier cuts. That means you have to be very careful while cooking the tenderloin. It can dry out fairly quickly and may not result in a juicy steak you’ve been craving for. Tenderloin is best grilled or fried with additional fats. If you wish to grill it though, you will have a nice cut of lean meat, that is tender and juicy, if grilled correctly. Generally speaking tenderloin is ready when the food thermometer reads 110-120F. You can, most definitely, cook a whole tenderloin. It will take about an hour of your time. I prefer to cook them in 2 inch slices to have something for dinner rather quickly. This recipe will call for slices of tenderloin, grilled with herbs and cooked quite quickly. 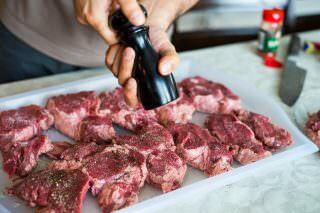 Let’s proceed with the tenderloin steak recipe, shall we? Trim off the excess fat and membranes. I personally try to keep most of the fat on the meat. 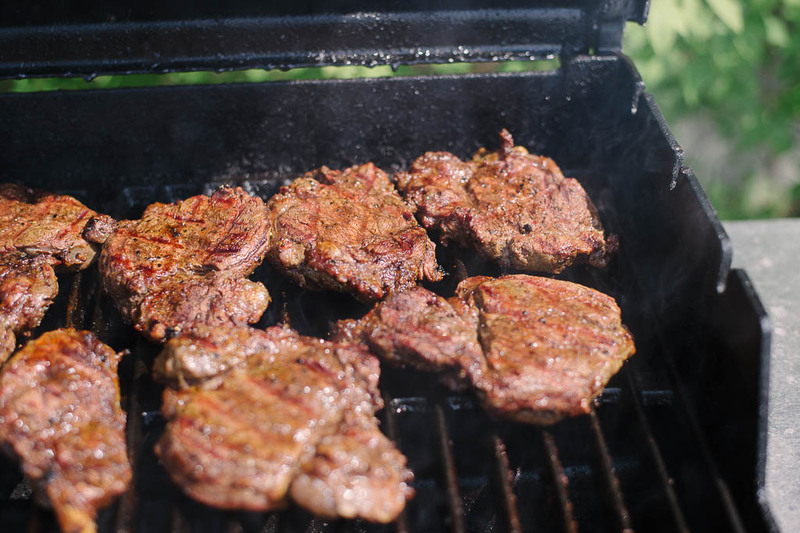 Keep the steaks out of the refrigerator for about 20 minutes before cooking. This is a good rule of thumb while cooking all meat and steaks. Once that time is up, marinate the steaks 15-20 minutes before grilling. You can omit these two steps and still have a great dinner. However, marinating process of tenderloin adds much juiciness. Salt and herbs have an added bonus of tenderizing the meat (hence enhancing the taste) and giving you a totally different experience. Start of with oiling one side of the meat, following it up with the rest of the spices; salt, pepper, paprika and garlic powder. Flip the meat to the other side and follow the same order of applying the marinade. Let the meat sit for about 15-20 minutes before getting set on the grill. My husband used a gas grill to cook the steaks. Heat up the grill to MEDIUM and place the meat on the grill for 4 minutes on each side. Check the temperature of the meat before taking them off from the grill. With steaks this thin, 4 minutes on each side should be sufficient enough even without checking the temperature of the meat. Set the steak on a cooking rack to rest for about 5 minutes. Tenderloin is quite dense. It will keep on cooking even after being taken off the grill. Sometimes I like to place a piece of butter on top and rest for 5 minutes before serving it. I hope you will give this tenderloin steak recipe a try. Please share your experiences and comment below the recipe. I would love to hear your thoughts and feedback. 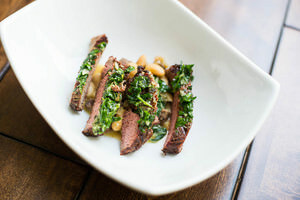 Don’t forget to pair this steak with our chimichurri recipe. 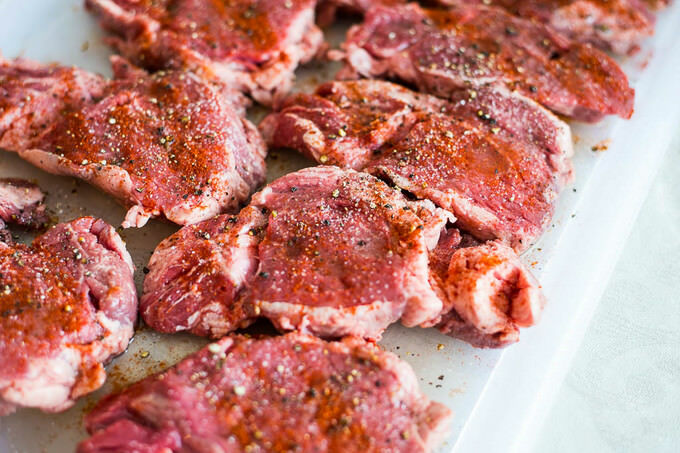 Let me introduce you to a delicious tenderloin steak recipe. While tenderloin is not a fatty piece of meat, it still can result in an amazing tasting steaks. I hope you like this tenderloin recipe as much as we do. 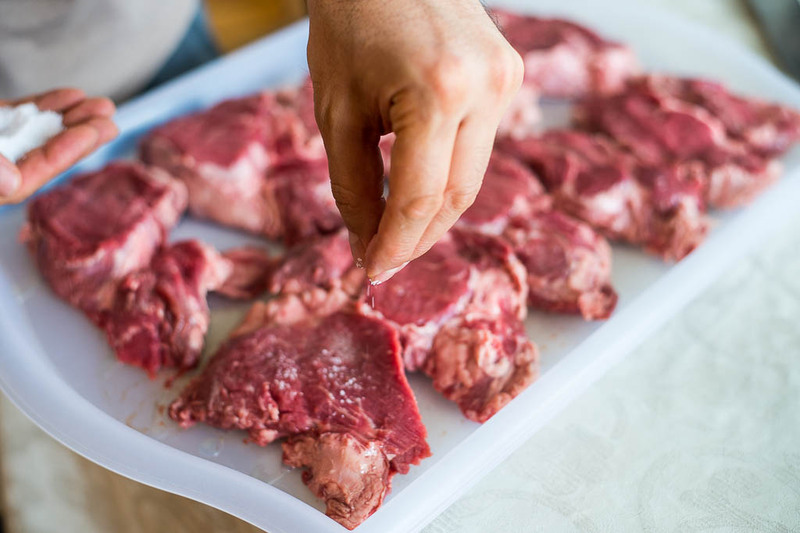 Tenderloin cut (a.k.a file mignon) is one of the finest cuts of meat. It is soft and very tender. It also happens to be one of the least fattier cuts. That means you have to be very careful while cooking the tenderloin. It can dry out fairly quickly and may not result in a juicy steak you’ve been craving for. Tenderloin is best grilled or fried with additional fats. If you wish to grill it though, you will have a nice cut of lean meat, that is tender and juicy, if grilled correctly. Generally speaking tenderloin is ready when the food thermometer reads 110-120F. You can, most definitely, cook a whole tenderloin. It will take about an hour of your time. I prefer to cook them in 2 inch slices to have something for dinner rather quickly. This recipe will call for slices of tenderloin, grilled with herbs and cooked quite quickly. This is a great looking recipe! My wife and I really want to start cooking from home more so we can save money, so we have been looking for good recipes. I love steak, so this could be perfect. I appreciate you mentioning to be sure to not overcook tenderloin because it can dry out quickly. I will definitely keep this in mind. Ernest, thank you very much for visiting my blog and leaving a comment. I really appreciate it. Steaks are both easy and tricky. 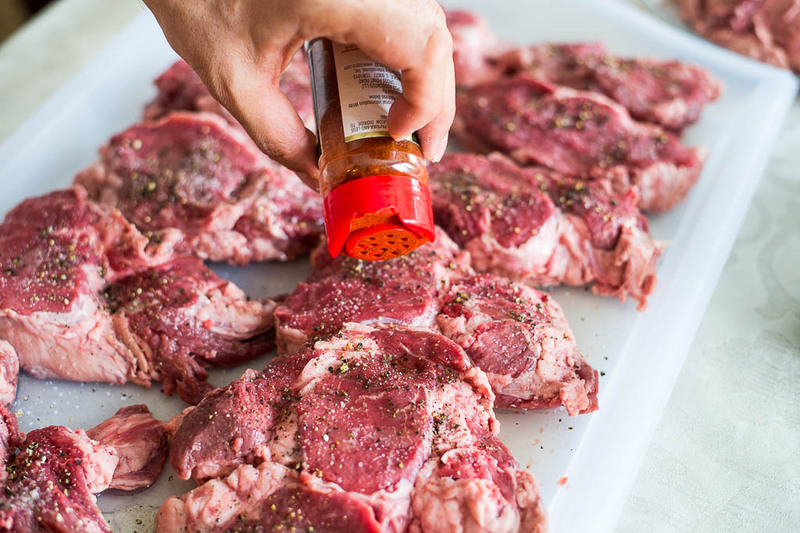 My husband and I have this perfectly tender, juicy steak (definitely well seasoned and more than just salt/pepper) and we are in forever quest of creating it with different cuts. I’ll be photographing another steak today, a much cheaper cut, but it will require the usage of sous vide. I will drop you a line when the recipe is posted. Or you can sign up for updates. My warmest regards to your wife! These images look awesome! I think my family would truly love this tenderloin steak recipe and would like to eat. That is going to be amazing!